At the weekend, we took the 250 mile trip over to Norfolk for the wedding of some great friends. We had a fantastic day on Saturday with them, and the on Sunday we had 2 choices; start the 5 hour journey home or head off and enjoy the amazing salt marshes on the North Norfolk coast. So of course we headed ............ to the coast. After visiting the stunning village of Cley next the Sea, we carried on to Blakeney where the tide was right in. Straight away I could see terns swooping and diving over the inlets. Oystercatchers were flying overhead, big brutish Heron Gulls were upsetting all the nesting birds. Little Egrets were posing gracefully on the banks and a Marsh Harrier was quartering in the distance. I have dreamed of seeing this stretch of coastline for so long that it took a while to take it all in. But there was one bird in particular that I was looking forward to see, the Little Tern. My eyes were drawn to every acrobatic bird in the sky and I had already spotted Common Terns. As the tide was so far in, the mud banks and beach areas were covered, so there weren't many waders feeding, so we decided to head over to Morston and take a boat to Blakeney point to see the seal colonies and hopefully the Little Terns. After crossing a small wooden bridge to get to the pier for Bishops Boats, I couldn't believe my eyes. A Little Tern soared straight past us and then headed off back towards the spit. I really needed to board this boat and get going. As soon as we left the mooring, we were in more open water surrounded by a variety of gulls and terns. It was one of those moments where there are just so many places to look, that you almost don't know where to look. A Sandwich Tern dived right in front of us and headed off with a whitebait. As we neared Blakeney Point, we could see so many birds, and quite a few chicks. Some of the Heron Gull chicks were of course quite large, but the tern chicks were still very young and trying to stay hidden and avoid being a meal for those persistent Herring Gulls. Oystercatchers were everywhere you looked and all in various stages of development. And then we reached the seal colonies. First of all we saw the Common Seals basking on the small area of beach left at high tide. The shingle beach and tufted areas of marsh grasses also provided perfect nesting habitat for the terns. The seals lazily opened the odd eye as we sailed past them. We headed away from the tip of the spit (caused by long shore drift as the sediment from fallen cliffs further along the coast gets washed up and builds on to the end of Blakeney Point) and towards a sand bank where a colony of Grey Seals were huddled on a tiny shallow area. One of the large male Grey Seals had been raiding the crabbing pots and had sadly got the rope from the pot stuck around it's neck. Being amongst the seals was amazing. Watching them watching us, watching them swim under the boat and then raise their heads out of the water for a closer look at us. And those dark deep eyes; I almost felt like I could just fall into them if I stared for too long. Of course there were Little Terns, and not just one or two, but lots of them, and chicks as well. But after all the anticipation of seeing the Little Terns (which was fantastic) the most amazing feeling I came away with was the importance and fragility of habitats like Blakeney Point. A few hours was not enough. I will be going back to Norfolk as soon as I can. This spring there has been a fantastic passage of terns through most of Cheshire's waters, including my patch Winsford Flash. Cheshire has one of the biggest densities of individual inland waters in Britain; some resulting from mining subsidence, some man-made from extraction of sand and gravel and some naturally formed after the ice-age. One thing is common to all though, and that is the underlying clay deposits. I've spent plenty of time watching all the areas around the Flash and managed great views of Black Tern, Arctic Tern and Common Tern, the latter being the most numerous. Sadly however, the passage of Terns died off quite quickly, and just 2 Common Terns remained (a possible pair I thought at the time). 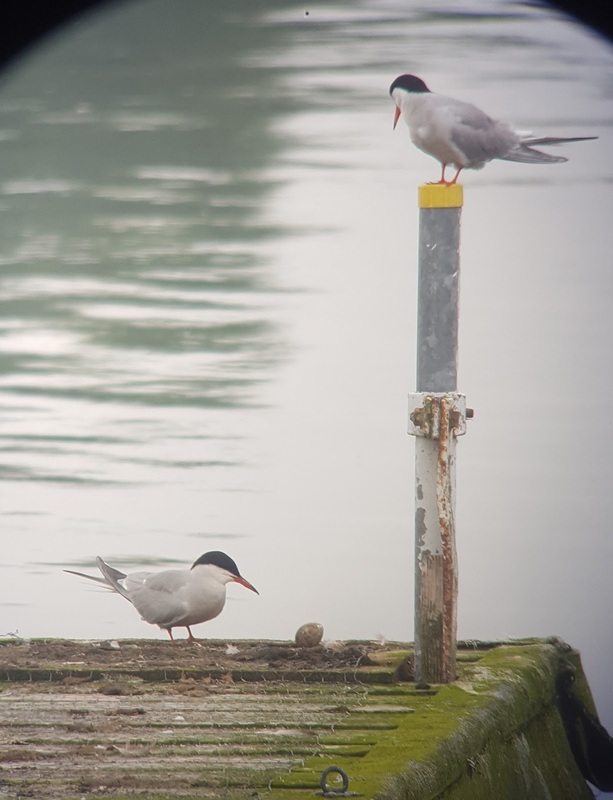 Common Terns breed inland throughout most counties in England, but sadly Cheshire is one of the few that don't really get inland breeders, so I was delighted (and totally surprised) to find on a visit one morning a pair nurturing 1 egg (Common Terns normally lay 2-3 eggs but occasionally just 1 and rarely 4) on a jetty of the Winsford Flash Sailing Club. The sight was amazing. This pair is the first to attempt to breed at the Flash and in inland Cheshire since 2004 I believe. As you can see from the images, the single egg was balanced precariously close to the edge of the pier. 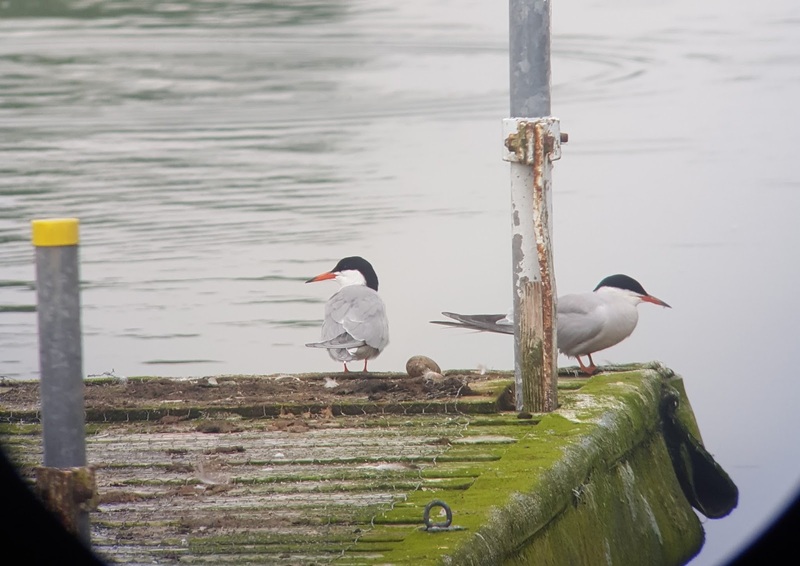 Whilst watching these terns I could see that they (as both sexes incubate) appeared to be struggling to incubate the egg at times because of the possibility of knocking the egg off and being able to balance on the edge of the jetty. Occasionally one bird would spend time very carefully attempting to nudge it into a better position. 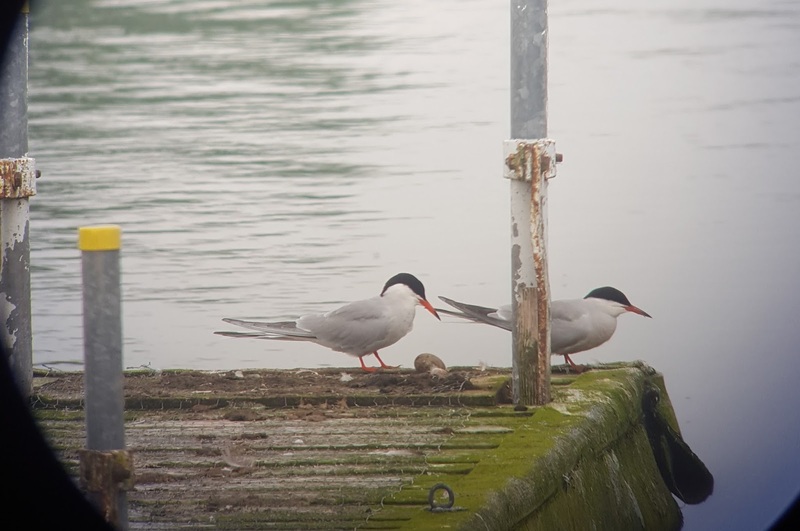 I think the Flash is/would be an ideal place for Common Terns to breed; water quality is okay and there is a good supply of small fish and invertebrates which the Terns can adapt to quite easily. As mentioned before, Cheshire is filled with water bodies very similar and the use of floating rafts could/ would be beneficial to all our inland lakes and meres to encourage breeding. This has proven to be very successful outside of Cheshire. You can't of course guarantee or control which species may use the floating rafts but it's a start! I have to say a huge well done and thank you to the sailing club for working with me to give these Terns the best chance of survival. They did fantastic work by fencing off that particular pier and restricting people from using the area around it. 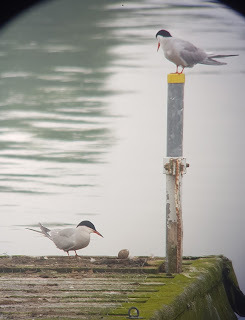 In the end though, I am truly gutted to say that this Tern pair's breeding attempt didn't make it this time round. Shortly after we discovered the egg, there was a prolonged torrential and squally rain shower. After the weather system had passed, the egg had sadly disappeared. I was gutted of course, but there is hope that these birds will occupy a nest next year at the Flash and be more successful. We watched the site for a good few weeks to see if the Terns tried again, but they have not been seen at the Flash since. The breeding attempt has been reported to the county recorder and my next plan is to explore the possibility of getting rafts in place in time for next year's breeding season.